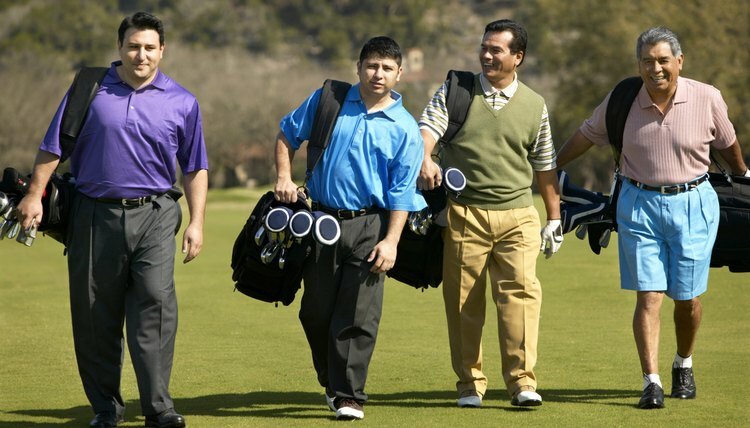 There are many different styles of golf that a group can play. The game of golf has existed for centuries, evolving from simple games involving hitting rocks into holes with sticks into the modern game we see today. While the general form of golf has remained the same in modern times, that has not stemmed the creativity responsible for making multiple variations on scoring and playing. Stroke play is the most basic style of golf, and is the style used by most weekend golfers and in most professional golf tournaments. In stroke play, golfers simply record their score on every hole that they play throughout the round. It does not matter how a player does on each individual hole, only what his final score is after a set number of rounds. The golfer that hands in the lowest score is declared the winner. Match play is a style of scoring in which the overall score of the players or teams does not matter. Rather the match is won by the player or team that has scored the best on the greatest number of holes. Every hole that a player outscores his opponent is won by that player, while any hole where the players are even is halved. At the end of the round, the team with that wins the most holes, wins the round, even if they had a higher overall stroke count. Skins play is a game which is similar to match play, in that it values simply the number of holes won, rather than the magnitude of the wins on each hole. Where skins differs from match play is the carryover of halved holes. In a skins match the value of a hole that has been halved is carried over and added to the next hole. This accumulation can lead to individual holes that are worth a great deal after several consecutive ties. Four ball is a style of golf in which two teams of two players face off in a match play competition. Each player plays his own ball on every hole. At the end of every hole, the score for each team is equal to the best score handed in by one of the players on that team. Matches of four ball can be scored using match play, skins or stroke play during a recreational game, however it is often a match play format in cup competitions. Foursomes is another game which features two different teams of two playing at the same time. Instead of four balls being played, however, only two balls are put into play, with teammates playing the same ball. On every hole, teammates alternate shots, meaning Player A tees off and Player B hits the second shot, followed by A again, and so on. Additionally, the player to tee off alternates every hole, meaning one player will tee of on all odd holes, the other on all even holes. Like four ball, foursomes can use all scoring systems but is most commonly played as a match in tournament play.